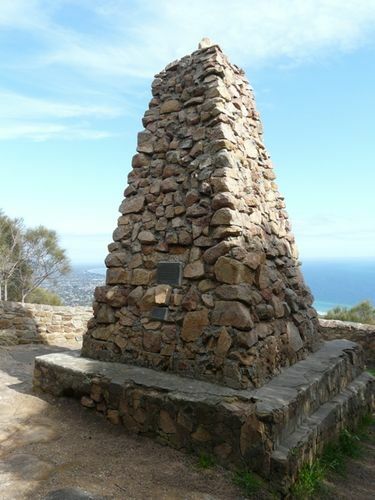 A monument commemorates the climbing of Arthurs Seat by Matthew Flinders in April 1802. The local progress association has built a cairn to the memory of Matthew Flinders on Arthurs Seat, at the back of the township. The memorial is to be unveiled, on Saturday, 5th December, and on the same day the association will entertain the Melbourne Automobile and Motor Cycle Clubs in the vicinity of the cairn. Hill climbing contests for the motors will also be held. Age (Melbourne), 21 October 1914. On April 27th 1802, Matthew Flinders, R.N. stood on this mount named Arthurs`s Seat by Lieut. Murray. Who Discovered The Bay, Jan 5th 1802. Franklin verified this spot in 1844.